Step 1: acquire large quantities of vodka, and whatever you wish to infuse it with. Suggestions include fruit (we like berries best), herbs (basil, mint, dill…), spices (cinnamon, vanilla), peppers and garlic. We suggest using second shelf vodka. Top shelf is expensive and won’t give you a dramatically different result. Bottom shelf vodka will taste of rubbing alcohol, plus whatever you add to it. 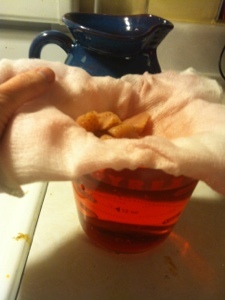 Step 2: sterilize glass containers (glass is best – anything else may impart weird flavors. I used glass milk jars, but I promise that I washed them and returned them to the bottle deposit when this was all over. We’re dedicated reusers and recyclers at Casa Minify). Step 3: wash and chop your berries, herbs, or whatever you’re infusing. 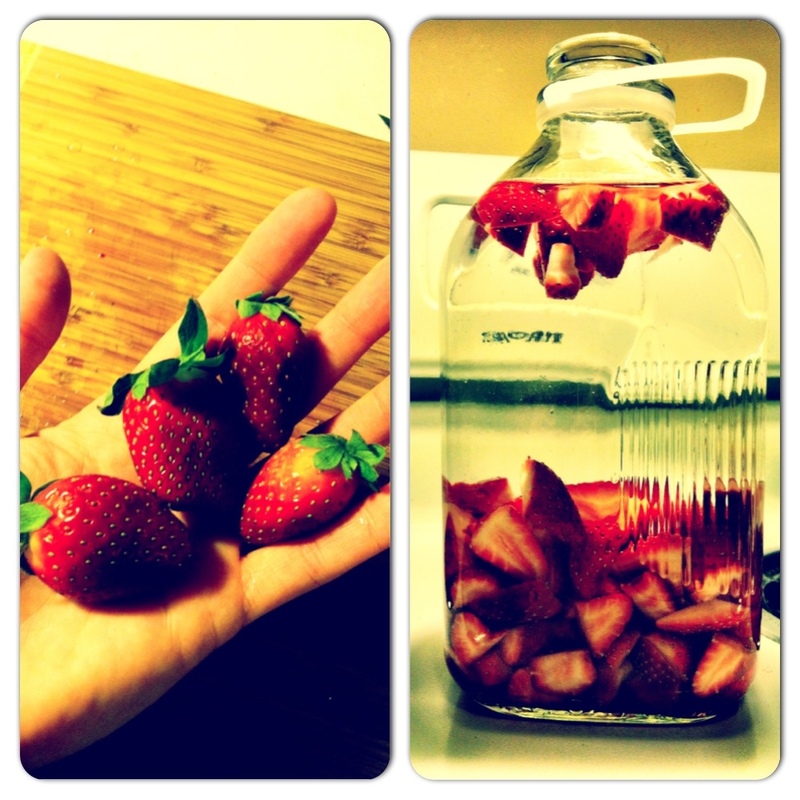 For the berries, we used organic strawberries to avoid infusing our vodka with pesticides or fertilizers. Then we washed and hulled them. 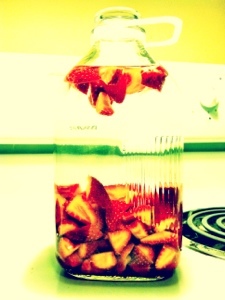 I used a quart of strawberries to a liter of vodka. Add fruit and vodka to glass container and cover (I use saran wrap and seal with a rubber band). Step 4: leave in a cool dark place to infuse for 4-5 days, then start checking the taste. You want to stop the infusion when the taste and color are to your liking. Strawberries do this genuinely odd thing where they leach all of their color into your vodka (turning it a lovely bright red color) and leaving you with naked, bleached berries. You’ll be able to see very clearly when this has happened. Decant your vodka into clean containers, straining it through at least two layers of cheesecloth to filter out the solids from the infusion. 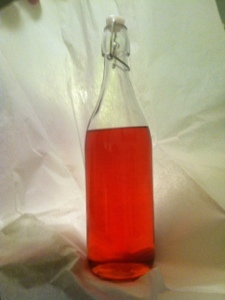 I strained mine into a pyrex measuring cup, and used that to pour it into the gift bottles and jars. (Confession: one year I was a good recycler who saved pretty berry jars all year to use for the vodka gift bottles; another year I ran out and purchased some nice looking stopper bottles at the craft store). Ta-da! You’re done! And you have lovely boozy gifts to give for handmade Christmas. naturally, mine didn't turn out nearly as beautiful as this inspiration photo! They turned out pretty well, so I thought I would share the recipe! Preheat oven to 350 degrees. Line standard muffin tins with paper liners; set aside. Sift together cocoa powder, flour, sugar, baking soda, baking powder, and salt into a large bowl. Add eggs, buttermilk, Guinness and oil, and mix until smooth, about 3 minutes. Scrape down the sides and bottom of bowl to assure batter is well mixed. Divide batter evenly among muffin cups, filling each 2/3 full. Bake until tops spring back when touched, about 20 minutes, rotating pan once if needed. Use a mixer (I do love my KitchenAid)…Cream the butter on high speed for 3 minutes. Add the Bailey’s and mix thoroughly. Slowly add the powdered sugar and mix until smooth (not grainy). Let ’em cool all the way down to room temperature before you frost ’em! This makes a rich, dark cupcake that tastes mostly of chocolate, and a frosting that tastes quite strongly of Bailey’s. Perfect for St. Pat’s, in other words! But even with the holiday now behind us, these babies would be good year round, so enjoy! Last week, my husband had a cold. The kind of cold that leaves you lying on the couch, asking for soup. Like a good and devoted spouse, I promised to make him soup…only to realize that we were missing most of the staples. So…I improvised! Here I give you what I think was a rather inventive, decent and quick soup, made with things we had in the pantry and freezer. Non-vegan addition: After eating the vegan version, I realized we had a few ounces of Trader Joe’s goat cheese in the fridge that wasn’t long for this world, so I melted it into the next bowl of soup. It was quite tasty! This week, my husband is all recovered…and has passed his cold on to me. So I guess we can’t say that this soup staves off the winter crud – only that it makes you feel better in the midst of it! Even so, at least I wrote down the recipe so that he knows what to make me for dinner tonight!